Due to its extremely high level of opacity, the PITT artist pen metallic is suitable for coloured or dark paper. It excels through its superior metallic effect and is the ideal tool for designing/embellishing greeting cards, bookmarks, place cards, invitations and photo calendars. Its ink is water-based and extremely lightfast. 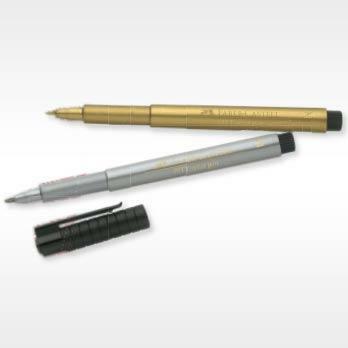 The PITT artist pen metallic is equipped with a specific 1.5 mm nib which corresponds to nib size “M”.